I have written about Claude Hamilton Verity, an inventor from Leeds, and his efforts to develop a commercially successful synchronization between sound and image before (see here). This post follows up on Verity’s trip to America, and looks at his efforts through his own words. On 9 November, 1923, Verity set off for New York aboard the Aquitania from Southampton, and on arriving declared he was meeting the vice president of the Vitagraph film company, J. Stuart Blackton. Verity’s purpose in traveling to America was to promote the synchronized moving pictures he had demonstrated at Harrogate in 1921 and London, Leeds, and Bradford in 1922. On 20 January, 1924, the New York Times published an article comprised largely of Verity’s pronouncements on the future of the sound film. If you want to read the article in full you will, I’m afraid, have to pay (about $4); but you can also find this article in The New York Times Encyclopedia of Film, 1896-1979. Verity’s pronouncements cover three topics: the need for the sound film to reinvigorate the interest of audiences, the prospects for the sound film, and the technical difficulties of the sound film and Verity’s attempts in overcoming them. Personally, I believe that music carefully edited and synchronized with the pictures adds greatly to the enjoyment of the production. And I really believe that the public is losing interest in the silent film – it maybe gradual but nevertheless I believe it is true. Producers have exhausted nearly every conceivable subject; they have clothed their artists in elaborate costumes and presented them with almost nothing on. Despite the fact that he spent so much of his time and own money on developing devices for the synchronization of sound and image, Verity seems to be ambivalent about their prospects. On the one hand, he thinks that there is a ‘great future’ in the synchronized picture and that pictures synchronized with sound, ‘be it voices or music, will enhance the worth of productions;’ while at the same time, he states that ‘I don’t think that talking and singing pictures have really much entertainment value.’ This is, I think, an odd opinion for some one who claims to have spent some £7000 on his own inventions for precisely this purpose (see here), but then many inventors fail to realise the potential of their devices because they view the problem from a purely technical standpoint. The synchronization of sound and image was a technological puzzle, but it took a showman to really make it work. Sound pictures, would Verity states, lead to new interest in films with the recording of music hall acts, sketches, and songs, but he sees it only as a means of recording existing acts and not of creating something new; and the principle beneficiaries would be the legion of small theatres that cannot attract such acts and can, therefore, substitute for them, with a film. The second half of the article is comprised of Verity discussing the technical problems of the sound film, but his first statement in this area is an intriguing plea for government investment in potential technologies. The history of almost all discoveries reveals how fate clings to the secrets stored up for the future welfare of mankind. Progress is ever slow. Inventors carry on their lonely and strenuous efforts secretly, and nearly always under the greatest financial difficulties. The state should alter this so that when an inventor could prove before an appointed commission that he had practical ideas, which, if developed, would be to the general welfare of the community at large, he could receive laboratory facilities or financial assistance. It stands to reason that the vested interests in the screen are not particularly anxious for the success of the synchronized film, but I think when a commercial solution is actually found they will fall over one another to obtain its actual control. 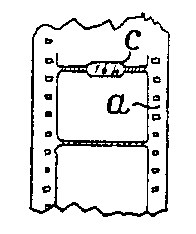 It is also interesting to note that there is a break in the patents filed by Verity in the UK for sound film devices from 1922 to 1928. Perhaps he found his New York trip to be particularly discouraging, as his swipe at ‘vested interests’ would indicate. Verity refers to his various attempts to produce synchronized films. The first attempt he refers to only to say that it was ‘too complicated,’ but gives no other details. The second attempt he refers to was a sound-on-disc system that would provide a ‘commercial solution.’ Verity states that this system has been successfully demonstrated in England several times, and is presumably the device demonstrated at Harrogate in 1921. This ‘second attempt’ is almost certainly the device described by the 1916 GB patent and the 1917 US patent and later improved on the early 1920s. (See here and here for details on Verity’s patents and how to access them). It would seem obvious that it is these patents that Verity has traveled to New York to discuss with Vitagraph. The ‘Verity system’ operated by recording the sound separately from the images, and then providing the projectionist with the sound and the disc and a mechanism that would allow him to keep the two in synchronization to within 1/25th of a second by adjusting the variable speed of both devices according to an array of lights that represents their relative speeds. This post introduces some facts and resources about the life and work of Claude Hamilton Verity, and engineer from Leeds, whose work on synchronous sound in the cinema deserves far greater mention that it gets (in histories of British cinema in particular). Included are some basic facts, some references to where Verity does appear in research on film, patents to Verity’s sound technologies, and some contemporary pieces that refer to Verity’s work. Claude Hamilton Verity was born at Leeds in May 1880, the youngest child of Edwin and Ann Verity. Edwin Verity was an ironmonger with a workshop at . Edwin was one of the Verity Brothers who had a large premises on The Calls by Leeds Bridge. Edwin later took premises round the corner at 168 & 169 Briggate as a hardware merchant. It was these premises that Claude was later to use as his workshop, and are now Bar Fibre. These premises are also located approximately 200 metres from the building at Leeds Bridge, where Le Prince shot his footage of traffic at the Corner of Briggate, Swinegate, and The Calls. Claude was brought up in Roundhay in the north of the city – an affluent part of Leeds that was also home to Louis le Prince and the Whitley family in the 1880s. The 1901 census has Verity listed as a student at a College of Agriculture and resident at Downton, Wiltshire. He also seems to crop up in Seacombe, nr. Liverpool, as an engineering draughtsman c.1910, and there is an engineer called Claude Hamilton Verity living in Scarborough in 1912, who is presumbaly the same person. He later moves to Harrogate (where his mother’s family were from), and then Harpenden, Hertfordshire. The synchronisation of machines for recording and reproducing sounds & movements. GB103407, Verity, C. H. May 11, 1916. Synchronization of Machines for Recording and Reproducing Sounds and Movements. Claude Hamilton Verity, of Leeds, England. No execution date. Filed May 23, 1917, Serial No. 170,531. Classification 352/23. This is a US patent. Synchronisation of machines for recording and reproducing sounds and movements. GB165489, Verity, C. H. Jan. 28, 1920. Synchronisation of machines for recording sounds and movements and for reproducing such sounds and movements by phonograph and kinematograph. GB318847, Verity, C. H. June 5, 1928. Apparatus for reproducing synchronously recorded disk records and kinematograph films. GB318688, Verity, C. H. June 19, 1928. Means for the synchronisation of broadcast wireless sounds and kinematograph films. GB320881, Verity, C. H. July 23, 1928. Improvements relating to the synchronous reproduction of picture films and disk sound records. GB321624, Verity, C. H. Aug. 13, 1928. Improvements relating to phonograph disc recording & reproducing machines and means for driving and synchronising same with kinematograph apparatus. GB322561, Verity, C. H. Sept. 24, 1928. Improvements relating to electric pick-up supports for gramophones and means for indicating the position of the needle in the record groove and to facilitate synchronous reproduction with picture projection. GB324411, Verity, C. H. Oct. 22, 1928. Most of these patents relate to sound-on-disk systems, but Verity’s appears to have adopted an approach that is less dependent upon the technology and focuses more on the operator’s problem of keeping sound and image together. It’s a very human approach to a technological problem : for example, the 1920 patent for the Synchronisation of machines for recording and reproducing sounds and movements uses two rows of lamps to indicate when the operator has achieved the union of sound and image by manipulating motors to bring the projector and the sound mechanism together, and which will tell the operator when they start to go out of synch. Figure 2 The Ellis Island register shows Verity was met by the vice-president of the Vitagraph Co. as he disembarked from the Aquitania in 1923. From reports in the local Yorkshire press, Verity’s system worked well and was popular. Verity apparently first demonstrated his talking pictures at the Royal Hall Theatre in Harrogate on 30 April 1921, before moving to London in June/July 1921, and then at the Albert Hall, Leeds in the first weeks of April, 1922. A contemporary description gives an indication of how image, music, and dialogue were brought together. The latest development in singing and talking pictures was explained at a demonstration on Saturday at the Philharmoinc Hall, London. The inventor, Mr. Claude Verity, of Leeds, claimed to be able to synchronise perfectly the spoken word and the lip movements by the players shown on the screen. By Mr. Verity’s system it is claimed to be possible to synchronise speeches, sounds, music, or anything that is at present being done at any of the London theatres – opera, drama, musical comedy, or revue. The inventor does not do away with the orchestra; his object is to synchronise the spoken word or song, the orchestra accompanying the gramophone while the movements are thrown on the screen. The two productions shown on Saturday, ‘A Cup of Beef Tea’ and ‘The Playthings of Fate,’ proved that the invention has great possibilities. The public interest in talking pictures can be gauged from this announcement of Verity’s 1922 shows in Leeds, which gives the size of the audience for the initial Harrogate run. Mr. C.H. verity, the inventor of the apparatus which has made the synchronisation of film and gramophone a practical proposition, is the head of a Leeds firm of hardware manufacturers and merchants. He is presenting his talking and singing pictures at the Albert Hall, Leeds, this week. Entertainments will be given each evening, and on three afternoons. The programme consists of the first film productions under the Verity system of synchronisation. Mr. Verity claims that the cost of these productions will be no greater than that of the majority of silent films, because it is cheaper to help out scenes and actions by words than by the multiplication of dumb show. There are interesting possibilities in the production of talking pictures in these days when the demand is all for novelty and originality in entertainment. Four performances recently given in Harrogate attracted over 5600 people. As another report indicates, the road to the synchronisation of sound and image was long and expensive, and it is important to remember that Verity was not a research scientist for a large corporation but ran a hardware manufacturers in the centre of Leeds. Mr. Claude H. Verity, the Leeds inventor, is making a bold bid to enlist the sympathies of the public in his talking and singing pictures. He claims that he has definitely and absolutely solved the problem of the synchronisation of the voice with the picture on the screen. Next week at the Albert Hall, Leeds, the local public will have its first opportunity of judging the merit of the invention. The solving of the problem of synchronisation was proved and admitted by the critics at Mr. Verity’s first trade show in Harrogate. There was criticism, Mr. Verity says, not in regard to the question of synchronisation, but in regard to the sound productions of the gramophone used. Mr. Verity has given many trade shows in various parts of the country, and never once has his claim to have solved the synchronisation problem been doubted. The only thing he needs he points out, is what might be termed a super-gramophone, and in this connection it may be stated, Mr. Verity has gone some way to meet this need. By the means of electric amplification and a new design of gramophone horn, the inventor ensures that the spoken word is clear and easily distinguishable. Very shortly a company is to be formed, and with the necessary financial backing the invention should not fail to succeed. Mr. Verity claims that everything in the way of singing or speaking can be synchronised by means of his method. He also wishes to make it clear that he does not intend to work on the lines of a monopoly in regard to his invention. Mr. Verity does not suggest that the whole programme in all the countless picture-houses should be entirely devoted to ‘talking pictures;’ he introduces the idea with a view to an enjoyable variation in the programme. The ‘Yorkshire Evening News’ is able to add that Mr. Verity has now had his ‘talking-picture’ idea patented in Germany. This is itself proof that he has not encroached on any previous idea on this point. The German system of granting patents is different to the British system. Here a patent is granted after a search through British patents only; in Germany the patents of all nationalities are first scrutinised. The problem of synchronizing films and records has been solved if we are to believe the reports of the demonstration of the Vitaphone in New York. There is an excellent and full account of the problem and of the solution in the Wireless World for September 15th. Three years ago we reported the departure of Mr. Claude Verity, who was experimenting in the subject, for America ; but it is not said whether he is at the bottom of the Vitaphone. It is the Western Electric Co.’s patents which have made the synchronization possible, worked in conjunction with Warner Brothers’ Pictures Inc (22). Altman, D. (1992) Hollywood East: Louis B. Mayer and the Origins of the Studio System. New York: Carol Publishing Group. Jackson Wrigley, M. (1922) The Film: Its Use In Popular Education. London: Grafton. 324,411. Verity, C. H. Oct. 22, 1928.